Wally was born and raised in Akron, Ohio, where his love of music was evident early on. He began playing piano at the age of 6 and, under the tutelage of teachers such as Laura LaGarda, C. Eugene Thrall and Dave Weyrick, he formed the basis for what became his life’s work. He moved to Los Angeles in his early 20’s and has been a well respected and highly accomplished member of the LA music scene ever since, having toured and recorded with some of the most well known and successful artists in the world. 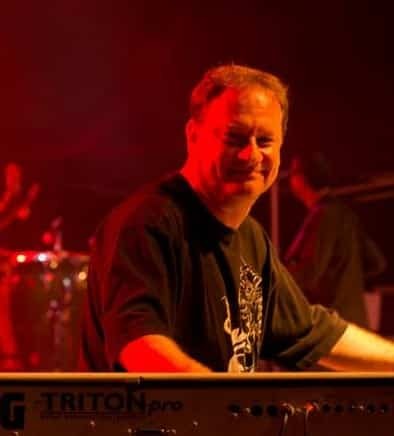 Some of the artists Wally has worked with include Toni Braxton, Pink, En Vogue, New Edition, Barry Manilow, Tom Jones, Arturo Sandoval, Gregg Rolie (Santana/Journey), Eddie Money, and the Anderson Ponty Band (featuring legendary Yes vocalist, Jon Anderson and world-renowned jazz violinist, Jean-Luc Ponty). Wally recently completed extensive North American tours with both Jean-Luc Ponty, as well as the Anderson Ponty Band. The Jean-Luc Ponty band featured longtime band members and friends Rayford Griffin on drums, Jamie Glaser on guitar, and Barron Browne on bass. The Anderson Ponty Band also featured Rayford and Jamie, with Keith Jones taking care of the bass. Check out the Calendar page for a list of tour dates.